Narrow Heart’s Discusses Debut EP, Music Writing Style, and Plans for the Future! Narrow Hearts are some up-and-comers with a debut EP under their belts called “Strive to Change” with that the band has written and recorded a variety of tunes and guitarist Jared Block and bassist Frank Falk discusses with me the band’s beginning, present, and future plans! 1. Narrow Hearts is the band’s name but where did the name actually come from and what does it mean? A: Before the Narrow Hearts era, the band had previously been known as Cain & Abel. After 4 years and a few member changes, we decided we had kind of “grown out” of the name and style we had developed. We really had no idea what the new name was going to be. I (Jared) was talking to a friend of mine about all of this and he had already had a few names set aside for a side project he was doing. Narrow Hearts was one of those names, and once I heard it, it pretty much stuck right away. The meaning behind the name can go in so many different directions that we like to tell people that you can “make it what it means to you”. For me it’s always been something like this: there are a lot of terribly lost people in this world, and I feel like we were meant to speak out, or “guide” the people with the “narrow hearts” back to the right path. 2. Tell us the brief history of your band. A: Like I said above, the band used to be known as Cain & Abel. It started with Jared and our old vocalist, Jake, in 2007. We sort of combined bands with our drummer Josh, our old bassist Jeff, and our guitarist Ike; who were doing a project of their own. With us just being freshmen in high school, and the other three in 8th grade at the time, we really weren’t doing much except trying to jam. Over the next few years, we started to get more serious. With the addition of our current vocalist Tyler, we started to play more shows and become more solid of a group. We played with that lineup of 6 guys for about four years, going on a few tours and playing a few festivals along the way. In the fall of 2011, we parted ways with Jake and were then going through the whole name change period. 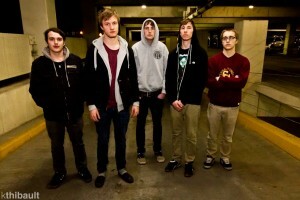 That fall we then headed out and recorded what would be Narrow Hearts’ “Strive to Change” EP. We continued the next few months as Cain & Abel, and then starting the new year of 2012 we then changed our name to Narrow Hearts. After playing a few shows with the new name, we had another member change, this time replacing our Jeff with our current bassist Frank. We just recently signed to the independent label We Are Triumphant this summer, and are now just finishing up in the studio with our debut full length album on the label. 3. Who are your musical and non-musical influences? A: We all listen to a variety of music, so pretty much every genre. As far as the type of bands that influence us, I would say: Stick To Your Guns, Stray From The Path, The Ghost Inside, The Color Morale, and many others. A: We try to stick to a positive message as much as possible. All of our songs try to relate to real life experiences, and try to help others that are unable to help themselves. 5. Who writes the songs, what are they about? A: We all write collectively for the most part, but when we start from scratch, Jared writes most of the music and shape of the song and Tyler takes care of the first draft of vocals. 6. Tell me about your EP ”Strive to Change” where did the name come from and is this a concept release? A: “Strive to Change” is overall a positive message, and was previously a song name before the album name was discussed. I feel it’s a very straight forward statement, and could really be used to describe any part of life. You should always try to better yourself, strive to be a stronger person. The EP is not a story by any means, but all of the songs talk about the positive concept “Strive to Change”. 7. How do you describe your music to people? A: Very fast paced, melodic, and positive. 8. Have you recorded any previous CDs or posted any audio files on the Internet? A: Yes, under Cain & Abel we independently released an EP and a full length. 9. What type of recording process did you use? Who produced your recording? A: We have done all of the NH recording’s with our good friend Josh Schroeder at Random Awesome! Studios in Bay City, Michigan. The process goes as simply as this: drums, guitar, bass, vocals. 10. How did you sell your CD’s/Audio Files? A: We have had our cd’s available on Itunes, Amazon, or any other online music store. Hard copies are also available at shows. 11. What are the biggest obstacles for bands? A: I would say it depends on the group of members. These are other factors I think affect bands at the start, and continue to affect the band until their end: age, education, location, life goals and expectations, to name a few. 12. What are your dreams and goals? A: We can collectively say that we are aiming to take this band as far as it can go. We don’t really know how far or how long we’ll get, but we will know when it’s time for it to end. I can tell you that that won’t be for a very long time. 13. What inspires you to do what you do? A: Our families, our friends in other bands touring the country, and anyone who has ever came to a show and talked to us about what we do. 14. What advice would you give to fellow bands? A: Never, ever quit. If it’s something that you love and want to keep doing, don’t let anyone tell you what you can or cannot do.